3 Calligraphy Tips You Need To Know – Helloteacher, Xin chào giáo viên! Calligraphy adds creative flair to handwritten projects and, even more than being beautiful – which it definitely is, calligraphy is an analog skill that offers much needed respite in our digital world. 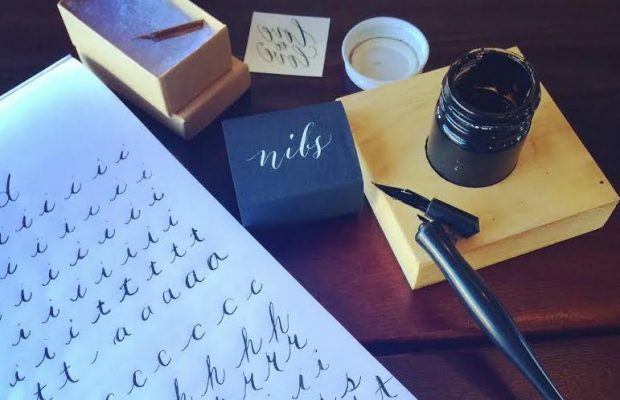 When Bianca Mascorro taught her calligraphy classes at CreativeLive, she shared some essential tips and techniques all beginner calligraphers can use to improve their letter forms and calligraphy style. One of the best parts of Bianca’s classes is how skillful she is at both teaching the basics and giving advanced calligraphers new information. But if you’re just getting back into it, like I am, these calligraphy tips are probably exactly what you need. 1.) 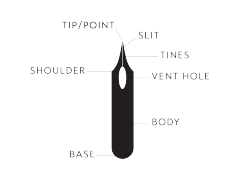 There are distinctive parts of the nib and pen and you should know them. Before you even begin stroking, you need know what what you’re dealing with. The actual tool you’ll be using is two parts — the pen holder and the nib. You can purchase a variety of both, but for a beginner, a basic pen holder (either oblique, which is bend, or straight) and a basic nib are fine. 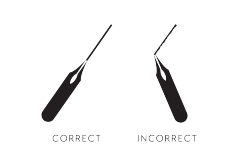 The nib, which is pictured to the left, also has distinctive parts, and knowing the lingo can be extremely helpful when, later on, you’re trying to figure out the exact tool you need. 2.) How you hold the pen matters. Unlike regular writing, where you can basically just pick up an implement and go, calligraphy requires a special method of holding and wielding your pen. “Holding your pen is critical to your letterforms,” says Bianca. Hold your pen at a 45 degree angle for optimal line drawing, Bianca recommends, and always make sure your nib is leading the line. This might feel a little strange at first, but trust me: It works. 3.) The stroke is key. Consider your average hand-written note — do you focus more on the word itself, or all of the individual parts of each letter? In calligraphy, at least at first, you’ll be doing the latter. Letters are composed of multiple strokes, and practicing those strokes is how you’ll become proficient. “I like to warm up,” says Bianca, “if you have the patience for it…do a whole page” of just strokes. Before you form a letter or even a word, practice making lines — eventually, you’ll get there. Be sure to check out Biana’s and fullosophie’s classes on CreativeLive, and, if you want to learn everything else there is to know about basic calligraphy, take a dip in Bianca’s Introduction to Calligraphy class and download our Beginner’s Guide.